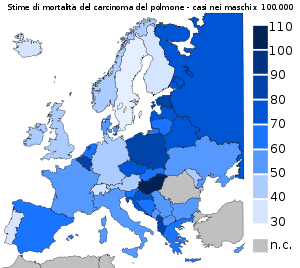 I tripped over the map of cancer morbidity from lung cancer for men in 2006 and thought it might interest. Today Nairn from St.David’s phoned me and we had a chat – she has joined those reading my blog! I’m fairly sure sure I know her but I can’t place her accurately, but she confirms we have met, and she also knows Lee from when Lee’s Mother Jean Rowland was suffering from terminal Brain Cancer – which was far too young and much too ugly! Nairn is St. David’s nurse based in Chepstow and only too willing to help in any way she can. We were discussing prognosis, treatment and side effects and when I explained my mouth ulcers and the fact that nothing seemed to make them much more bearable – even when I asked if mouth wash came in 50 gallon drums to save on packaging – I’m still using the two mentioned in an earlier blog but although they help it is none too wonderful – Nairn was really helpful. She suggested a couple of products and then said since I had not tried them she would have a chat with one of the Doctors and get a prescription phoned through. I’m really pleased that Wales has opted for free prescriptions – not that pay prescriptions were too scarey but just for mouth wash on Saturday I spent £20 and having drawn ZERO income since we shut the shop almost 7 years ago cash is at a premium! I have been loath to draw on Government and benefits as foolish as it may seem to some we can cope without State aid – it may be a struggle at times now that I have been off work with cancer for over 10 years! It is a great relief that we bought our property and have thus kept our bills down and it was why it was so particularly vile of UKIP as a political party to abrogate on political argument and resort to dishonesty and lies to try to silence my opinions and the facts I publish on CLICK HERE the dishonesty in their inability to act with honour and integrity was beneath contempt and tells you all you need to know about UKIP and what a vile prospect they offer if ever elected. If you want more details of their dishonourable and contemptible behaviour CLICK HERE these unpleasant cowards are only too happy to use any underhand method to silence the criticism of their supporters and there were even woops of glee published by at least one member of UKIP’s leadership team when my cancer was announced. There has been no apology nor censure from UKIP, The CIB or the debased Freedom Association (still trading on the reputation of its founder Norris McWhirter!) Yet the comments were clearly endorsed by these three organisations. Fortunately such filth are in a minority in life – significant but a tiny and contemptible minority. I was spared the exposition of another blue bell blown up ad absurdum to show a photographic fault had there been a possibility that the bell would have dwarfed those of Notre Dame and look what that did to Quasi Modo! The phone rang and Nairn has sorted a prescription which will be with Boots in the morning and I can thus pick it up on route to Velindre for the next dosing of chemo. As you can see from the >CANCER DIARY II< on the >TAB< at the top I have to be at Velindre by 11:00hrs. for a full set of bloods and as the lab insists on a full close for lunch from 12:00 to 14:00hrs. I shall then have to hang around until the results come through to the chemo cardboard box to start my infussion but as I recall tomorrows dose is a single chemical ‘gemcitabine’. Tomorrow will tell! Though I do admit that having Nairn available to hand hold or to help Lee or I does make a difference – especially as much of the battle is to keep confident and have a positive attitude. This entry was posted in Brain Cancer, Cancer, Jean ROWLAND, Lung cancer, Mark CROUCHER, Mick McGOUGH, St Davids, TFA, The CIB, UKIP. Bookmark the permalink.